IBM's experiment with group authorship for Cloud Computing interoperability is starting to pay off. Earlier today, Doug Tidwell posted the first draft of a Cloud Computing Use Cases White Paper produced extensively via a new Google group created to help define the various use case requires. The white paper was also released under a Creative Commons License with the intention of remixing for use within other white papers and marketing materials. In an email by Tidwell he said everything in the paper comes from the comments posted on the Google group. But also admits there are several areas that need a lot more discussion. The introduction of the whitepaper states that it utilizes existing customer based scenarios with the goal of highlighting the capabilities and requirements that need to be standardized in a Cloud environment to ensure interoperability, ease of integration and also portability. It strives to ensure that cloud computing evolves as an open environment, minimizing vendor lock-in and increasing customer choice. 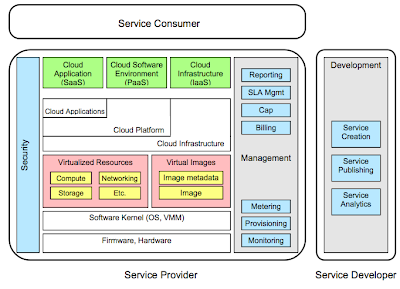 At first glance the paper is great starting point outlining some of the key aspects for an interoperable cloud ecosystem. It borrows heavily from the NIST definition of cloud computing, but I think it is a smart move to align with the NIST definition rather then to try to create yet another. I also liked the Taxonomy diagram, which brakes down the various aspects into three main groups, Service Consumer, Service Provider and finally Service Developer. All in all, a great starting point. Keep up the good work! Review the draft white paper here.